Having a break from your daily activities is a must! No matter how good you are at what you do, you need to hit the ‘pause’ button every once in a while. Frequent breaks are nice when you know how to relax, even if the break is no more than fifteen minutes. In the era of internet, you are able to escape your reality for a brief moment, and do whatever you like. There is no doubt that one of the best way to have some fun is by browsing through some funny photos and videos. This is why we prepared the following list! It is more than enough to amuse you and make your fifteen minute break even better! Many people want to be different from the rest in every way they can. One of the most popular ways you can underline your style is by modifying your vehicle! However, this is not an easy thing to do, because there are many ways you can do it in a wrong way! As you can see, mixing different styles does not lead to an aesthetic result. 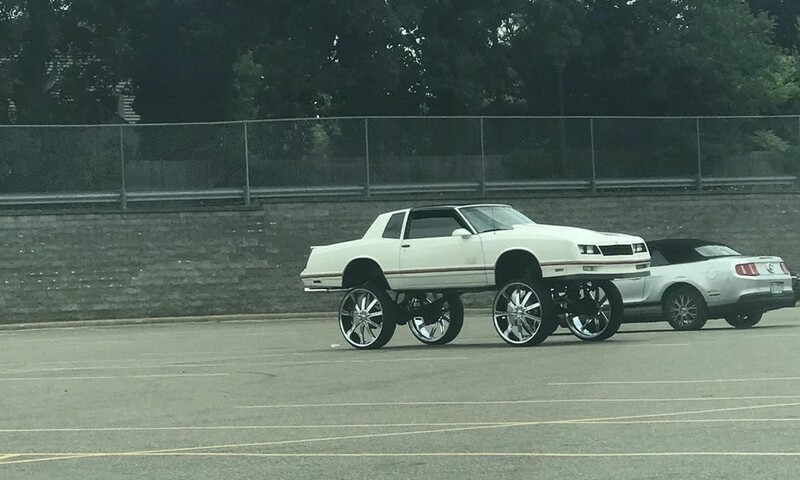 These huge wheels are not suitable for that car, but one thing is for sure – it definitely stands out from the crowd! This is probably what the owner wanted, and he probably likes his car, which is all that matters! It seems that creating some kind of marketing activity is not as easy as we might think. We are not talking about a huge campaign or creating a TV advertisement. Even making a simple sign proves to be a hard task! 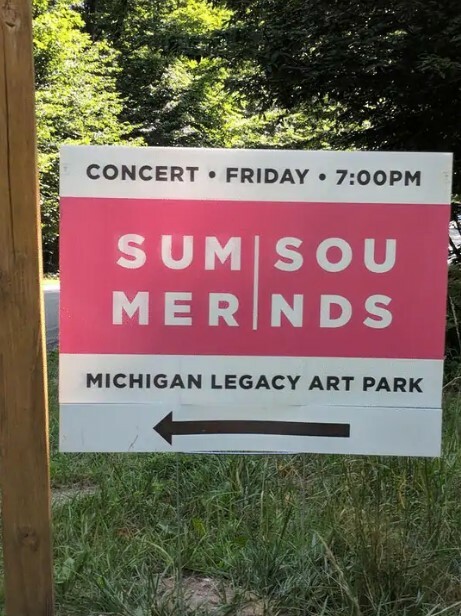 As you can see, someone tried to be creative when making this sign’s design. That line you see in the middle should have been horizontal instead of vertical! When you leave your kids at home, you need to make sure that they have some kind of supervision. If you know that they tend to make a mess when left alone, then you must take the necessary precautions! As you can see, this kid’s parents were not careful enough. The little rascal took advantage of that! 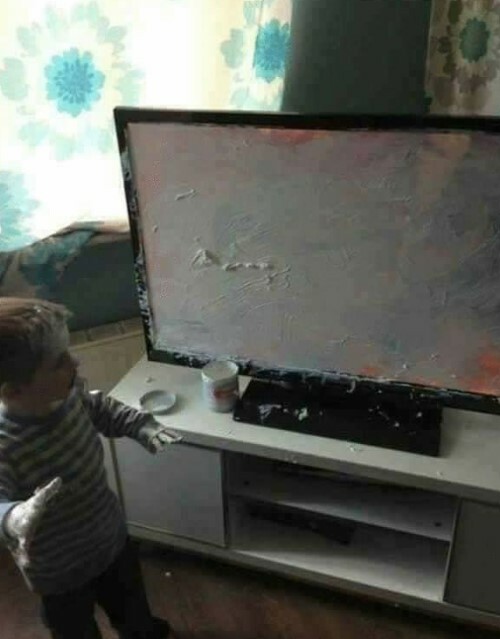 As you can see, the kid was able to paint the whole TV without missing a square inch! Sometimes a song or a post on social media can spark a new trend! 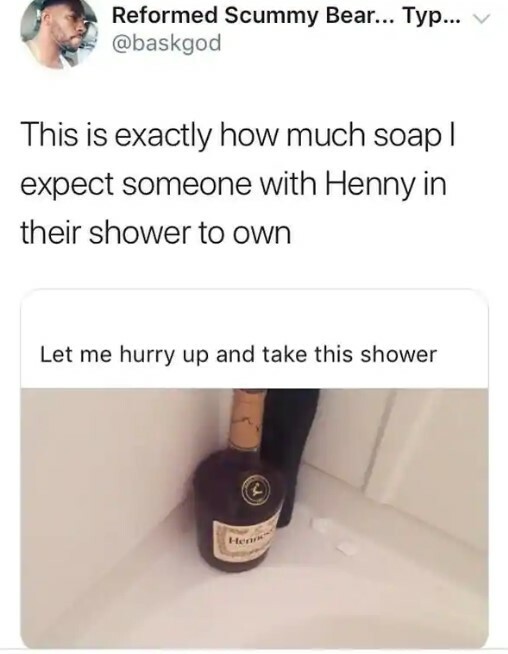 The case with the Hennessy whiskey is exactly that. Of course, the whiskey is very good, but we guess that its qualities are not the reason why people like mentioning it. The reason is the abovementioned trend! As you can see, some people take things a bit too far! We guess that trends come and go, and this one will go as well. Meanwhile we will just have to wait it out. Online shopping is becoming more and more popular and we guess that real stores will start closing soon. It is very convenient and saves time. However, not everything about it is good. 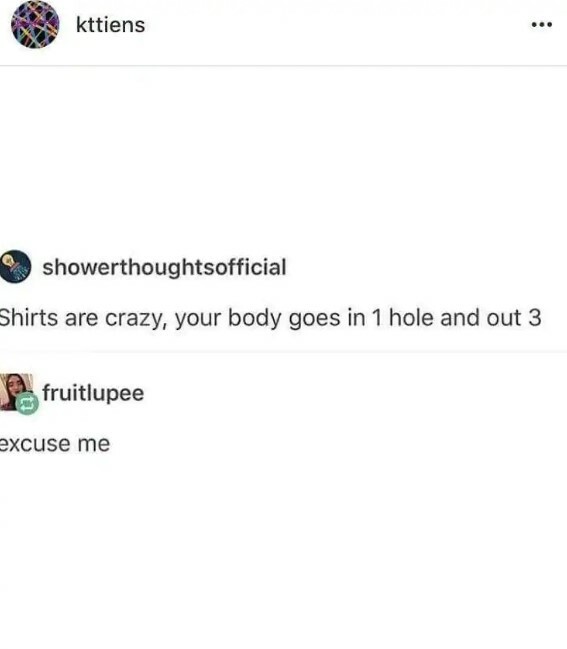 First of all, if you buy clothes or shoes, chances are that they will not fit. It is kind of annoying to return them and later receive the ones with the correct size. 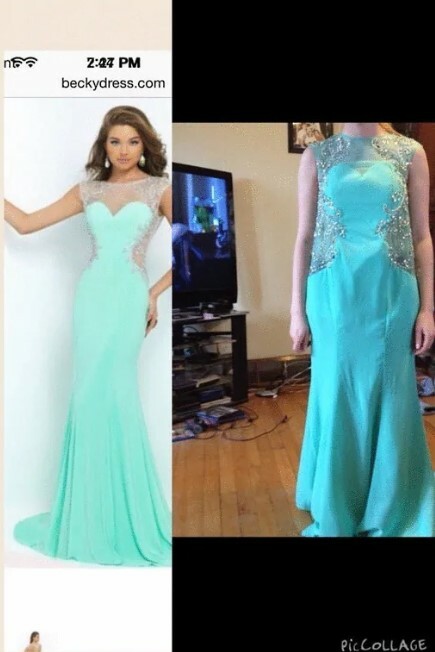 The worst part is when the item you ordered has nothing in common with the one you ordered! The photo above shows how this looks and we know it is disappointing. We have always respected people who take care of dogs and train them. It is a very responsible and hard job to do. Not everyone could do it, because it takes skill and dedication! Of course, it also takes courage, because dogs can be unpredictable sometimes. In this case the right reaction might be the most important thing of all! This person found the hard way that you should always be prepared for the unexpected! 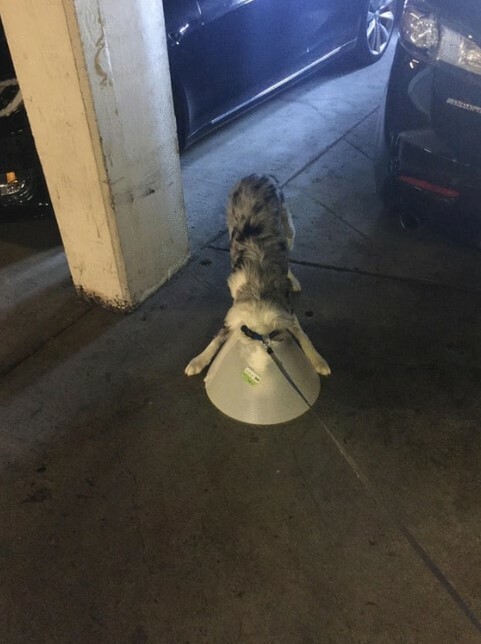 If you have a dog, chances are that you know how it hates going to the vet. Most dogs can sense this in advance and they will do anything to avoid it! However, the dog from the photo lost the battle and the trip to vet obviously happened. Unfortunately, a collar had to be put on. As you can see, there is always an initial struggle to accept the collar. Hopefully this dog will get rid of it soon! 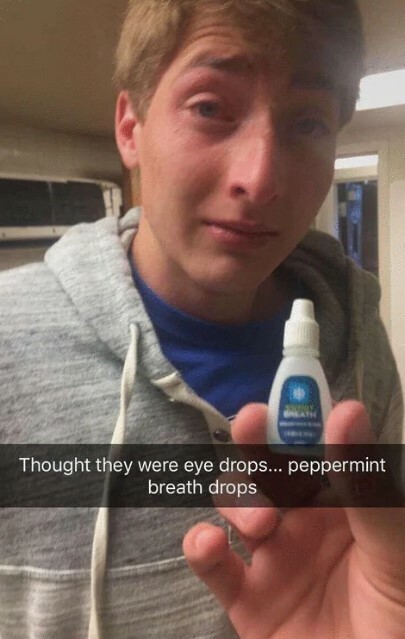 First of all, we would like to know the reason why would someone make breath drops? It seems a rather inconvenient solution compared to the traditional spray. But this is not the point here. You know how stingy anything that contains peppermint is, right? Imagine dropping some of this stuff in your eyes! We guess that it resulted in pain and severe irritation. This person found all of this the hard way after making that terrible mistake. 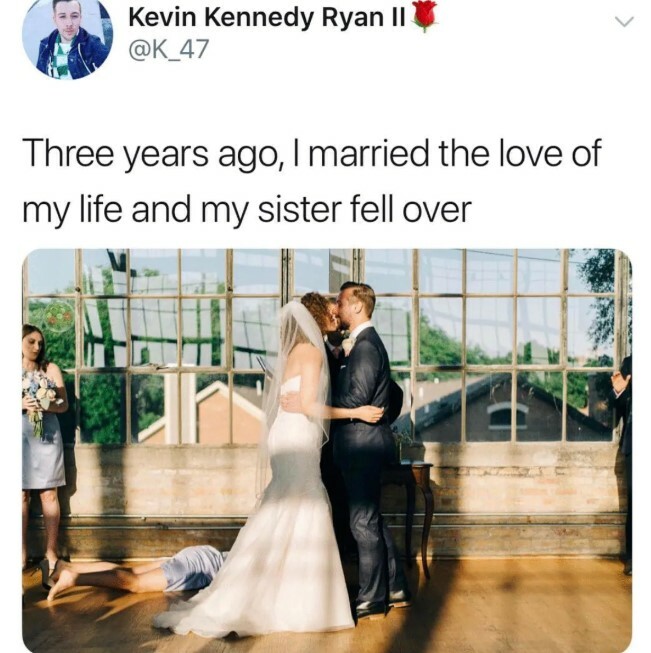 We hope he quickly got over it. We have seen a lot of wedding photos and we like all of them! 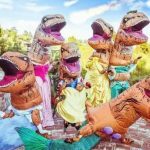 They can vary from funny to beautiful and even outrageous, but they still capture some of the most important moments in people’s lives! This is why all of them are good in their own way. Of course, the funniest among them are our favorites. The example shown here is hilarious! We would like to know what happened here. It seems that the woman tripped over and fell just when the photographer was about to take the photo. The timing was perfect! 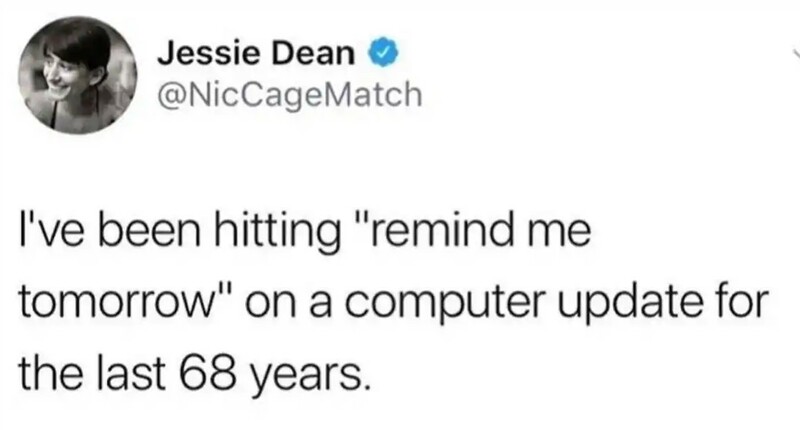 Some people do not realize that having a computer requires a lot of maintenance! Regular cleaning of the hardware and updating or upgrading your software is essential! However, these things require some patience, because some updates can take forever! This person was probably tired of this process, and we know how that feels. We postpone updates often, too. Sometimes all you need to spin the cogs in your head is a simple riddle or a joke! Thankfully, the internet and particularly the social media platforms are full of those. When you read a post containing something ridiculous as this one, you instantly become hooked! Of course, it is not some kind of a breakthrough or an amazing discovery. It simply gives a new perspective on something common. 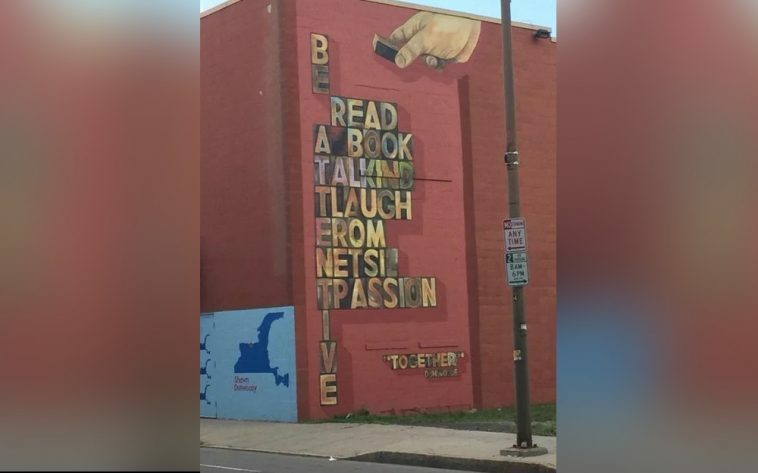 Despite this, we are still puzzled by this post and we love it! One of the best things you can treat yourself to during summer is a giant cone of delicious ice cream! When you go to stand, you either grab your favorite flavors or you just sit there wandering what to choose. The variety is always too big to decide instantly. However, in some cases you know what not to order for sure! 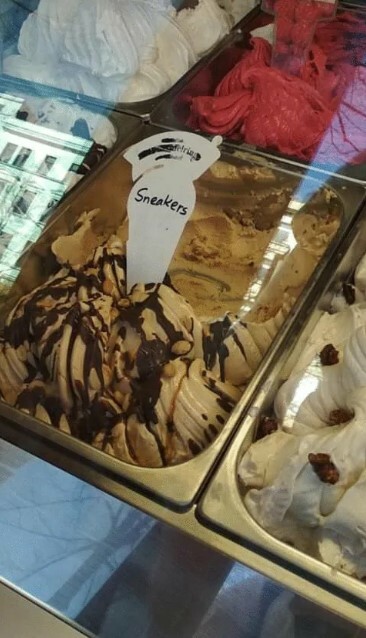 We guess that the sneakers-flavored would be the least chosen option! Of course, this is just a mistake, and the flavor is Snickers, but we still imagined what the other taste would be like! Yuck! We really laughed out loud when we saw this cute doggy! Just take a look at that face! 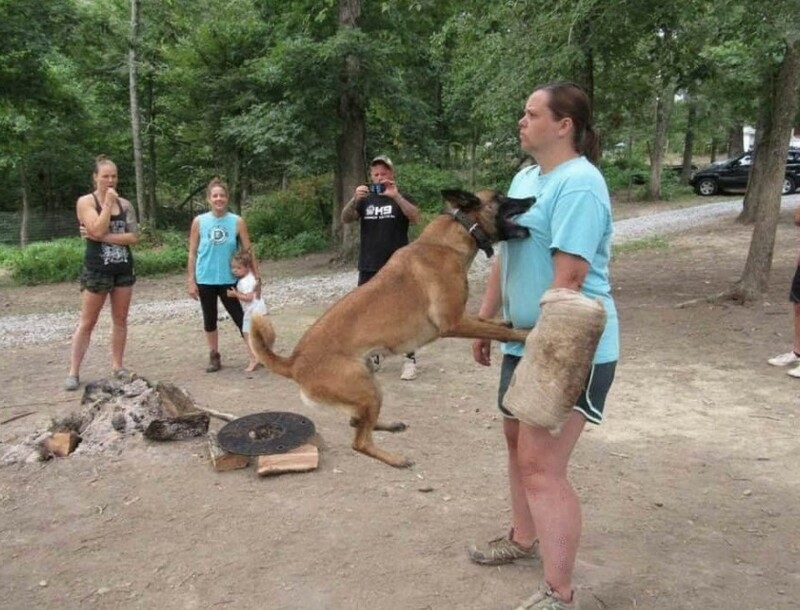 It would be funny if it was just the dog, but there is a lot more in the photo than its facial expression. When you read the sign in the back, you will immediately understand the real message of the photo! 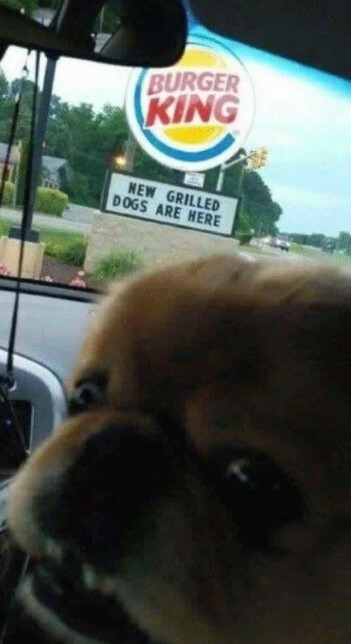 The person who took it wanted it to look like the dog reacted to the Burger King sign. The idea was very clever and we love the photo! 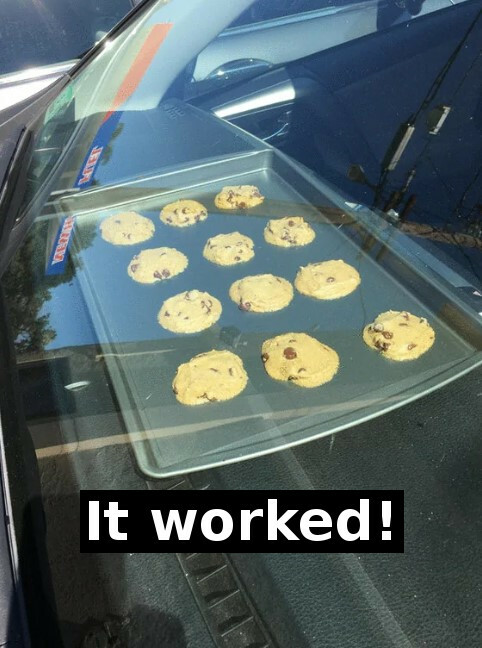 It seems that experimenting with baking cookies in a hot car is becoming a trend. Some people might consider this to be more or less controversial. However, we guess that the main question here is if you could actually bake the cookies or not. 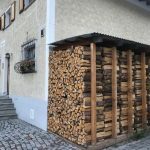 We believe that it would take a lot more time compared to a traditional oven. This may be a problem, because there are eggs in that dough. Exposing it to direct sunlight for hours may not be the best idea. If it was up to us, we would spend the entire summer on the beach. It is definitely the place to be, and the party would go on without a break. However, you can have fun in a lot of different ways while chilling near the sea. 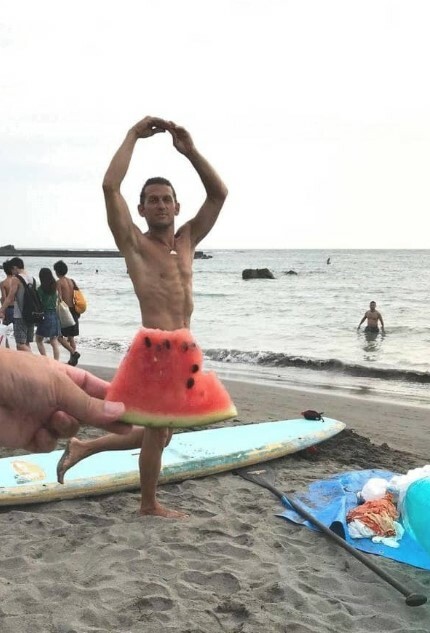 Apparently a slice of watermelon and model are more than enough! You just need to cut the fruit and set up the model in the right position, and your funny photo will be a fact within seconds!